To avoid you from facing hotel accommodation problems in Mongolia due to full bookings during the tourist peak season and any unreliable services, Sod Namnaa Company is happy to book the best hotels in Mongolia for you. If you are building a complete itinerary with Sod Namnaa Company, please inform us about your hotel choices. If you are only booking accommodations, please list your hotel preferences when contacting us. If you have not found the necessary information or the hotel required to you is absent in the list address to employees of travel company Sod Namnaa company and we shall help you. The first FIVE STAR hotel in Mongolia. Hotel Ulaanbaatar operates more than 40 years of hotel business through the Mongolia and has many years of vast experience in this area. 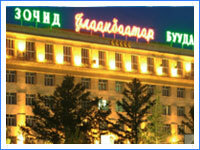 Ulaanbaatar hotel is located next to Sukhbaatar Square. Located: Ulaanbaatar hotel located downtown, within easy reach of the main tourist attractions and the business center of the city. 30-minute drive to the International airport and 15-minute drive to the railway station. 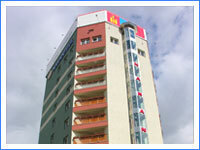 Brief information about the hotel building: Ulaanbaatar hotel opened in 1961, renovated in 2003. 6 floors. 10 of them are non-smoking rooms. Khan Palace Hotel, a modern, elegant hotel, offering the best of both worlds-a subtle blend of Western and Oriental tradition encompassing contemporary hotel design and convenience with classic standards of service and excellence. Khan Palace Hotel features 102 hotel guest rooms and suites; luxuriously appointed and classically-styled; yet in keeping with the ever changing needs of the international traveler, each providing ultra-modern digital technology and communications. Located: Khan Palace hotel is a deluxe hotel located 19 kilometers from Chinggis Khaan International Airport, 6 kilometers from the Main Railway station and 2 kilometers from Sukhbaatar Square. Brief information about the hotel building: Khan Palace hotel opened in 2005. Khan Palace offers casual dining in stylish surroundings in The Oasis restaurant. opportunity to enjoy a variety of cuisine in an informal atmosphere. Open from 7 AM to 10 PM, seat up to 160 people. Authentic Mongolian cuisine and our wide selection of the world’s famous wines. traditional meals, afternoon tea and a selection of refreshments in a relaxing environment. and travel arrangements, translations, courier services. Audio-visual equipment is also available upon request. from small boardroom meetings to large conferences or social celebrations. up to 200 people theatre-style. Bayangol Hotel Ulaanbaatar Mongolia - Situated in the heart of downtown, the Bayangol hotel is the place to stay for business and pleasure in Ulaanbaatar. With 200 tastefully furnished rooms, a wide variety of facilities and excellent service, you will soon discover why so many of our guests just keep coming back. 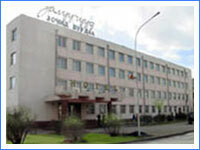 • Bayangol hotel post address: 23, Chingisiin Avenue, Ulaanbaatar, Mongolia. 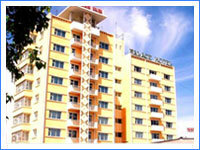 • Located: Bayangol hotel located in the business center of the city. 19 km to the International airport and 2 km to the central railway station. Walking distance to the main tourists attractions, theaters, circus, local market. 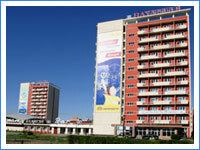 • Brief information about the hotel building: Bayangol hotel opened in 1963, renovated in 2003. 12 floors. 209 rooms: 190 standard rooms, 19 suites. as well as the traditional Mongolian food. Nomin restaurant for 30 seats (European and Mongolian cuisine). Banquet room (cocktail parties for 40-50 people). and host of other dishes awaits you. interesting competitions, nice service and feeling of other times. Conference rooms from 8-seat to 60-seat. • If you have not found the necessary information or the hotel required to you is absent in the list address to employees of travel company "legend tour" and we shall help you. • Transfers between 11pm - 7 am local time incur 15% surcharge. Chinggis Khaan Hotel Ulaanbaatar Mongolia - Ideally located on the east side of city center, a few minutes from the Academic Theatre of Classical Art, Art Gallery, shopping and museums. 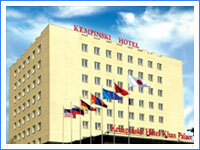 • Chinggis Khaan hotel post address: 5, Tokyo Street, Ulaanbaatar City, Mongolia. • Located: Chinggis Khan hotel located downtown, within easy reach of the main tourist attractions and the business center of the city. 30-minute drive to the International airport and 15-minute drive to the railway station. • Brief information about the hotel building: Chinggis Khan hotel opened in 1995, renovated in 2003. 11 floors. Check-in time 13.00, Check-out time 12.00. Mongolian restaurant (Mongolian national and oriental cuisine). • If for you it is necessary transfer, the guide or other services, inform us on it at the reservation of hotel. The Palace Hotel is conveniently situated among a number of city tour attractions of Ulaanbaatar , including the Bogd Khaan Palace Museum , Naadam Stadium and Zaisan Hill , all of which are located within a few minutes walk. The location of the hotel is a very quite and clean area with fresh air of Tuul river and forests of the Mt.Bogd Khaan. Only five minutes by car, ten minutes of walk from the very center of the town and a 15 minutes drive from Buyant-Uhaa international airport make the Palace's location the most convenient among all hotel locations in Ulaanbaatar. A good location among major downtown attractions of Ulaanbaatar; Quiet natural environment of the Tuul River and Mt. Bogd Khaan; Picturesque view of suburban Ulaanbaatar through guest room windows. • Located: Hotel is situated among a number of city attractions of Ulaanbaatar, including the Bogd Khaan Palace Museum, Naadam Stadium and Zaisan hill, all of which are located witching a few minutes walk. The location of the hotel is very quiet and clean area with fresh air of Tul river and forests of the Bogd Khaab mountain. Only 5 minutes by car, 10 minutes of walk from the center of the town and a 10 minutes from international airport makes the hotel the most convenient among all hotel locations in Ulaanbaatar. Narantuul Hotel, centrally located in the heart of the capital city of Mongolia, The Narantuul Hotel, Ulaanbaatar is a five-minute drive to Railway station and 25 minutes to Chinggis Khaan airport. 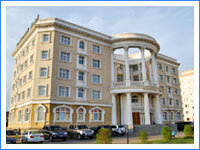 • Narantuul hotel located: Centrally located in the heart of the capital city of Mongolia. The world wide traveler , to it is newly renovated facilities Ulaanbaatar is most beautiful district has always attracted tourists intellectuals and business people when visiting the capital city of Mongolia. The "Puma Imperial" hotel is comfortable hotel situated in the heart of Ulaanbaatar city and conveniently located near The Government House, Central Bank, national Historical Museum, Natural History Museum, Science Cultural Center and Central Post Office. The hotel is only 10 minutes from the Railway station and 30 minutes from the International Airport. • Located: The Puma Imperial hotel is comfortable hotel situated in the heart of Ulaanbaatar city, which is surrounded by the Government house, Central bank, Credit bank, National historical museum, Natural museum and Science Cultural center. • Brief information about the hotel building: 4 floors. The Puma Imperial hotel has 31 comfortable rooms of which 5 family 26 standard rooms. - 9 extra bed rooms. This hotel has total finest rooms. Every rooms have the telephone for the domestic and international calls, its own mini bar and refrigerator for your convenience. Television with several international channels. For long term visits the hotel offers Suites which include a small kitchen. Our guests can choose from Asian, European and Indian restaurants. Indian restaurant. On our breakfast batter from 7.00 AM - 11.00 PM. Room charges included breakfast's price. International long distance phone calls. Hotel has heated indoor garage is case you need to take care of an automobile during stay at the hotel. Tuushin Hotel Ulaanbaatar Mongolia. 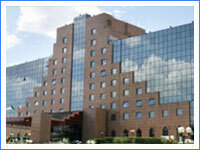 Tuushin Hotel offers you luxury, convenience and professional business services all in one location. Comfortable rooms provide you with all the services you need do business or to enjoy a time of rest. Your rooms comes with a buffet breakfast in the International Restaurant. 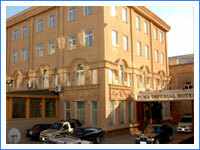 • Hotel post address: 2, Amaryn Street, Ulaanbaatar, Mongolia. 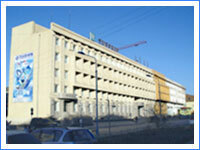 • Located: Tuushin Hotel is located at the Prime Minister Amar‘ street,2 (just right side of Sukhbaatar Square). • Brief information about the hotel building: Tuushin Hotel opened in 1996. 3 floors. The bathrooms are sanitized, spacious and well accommodated. both local and international cuisine. Continental Hotel. In the heart of Ulaanbaatar, the political, social and cultural capital of Mongolia, stands a monument to classical elegance. The Continental Hotel delivers service and style second to none in Ulaanbaatar. • Located: Zaluuchuud hotel is located in the east side from the city center. 30-minute drive to the International airport and 15-minute drive to the railway station. • Brief information about the Zaluuchuud hotel building: Opened in 1970. Renovated in 2003.